Shelley Kerr's 16 months as Arsenal manager ended on a triumphant note as the Gunners eased to a 2-0 win against Everton in a one-sided FA Cup final. 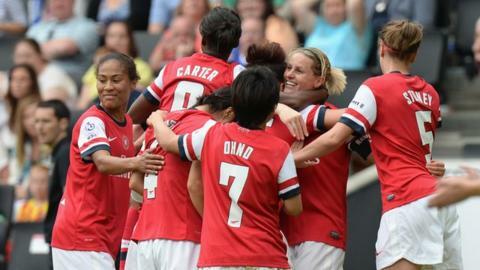 Striker Kelly Smith scored an early opener before setting up Yukari Kinga to seal the victory on the hour mark. Kerr resigned a week ago with her team bottom of the Women's Super League. However, they looked anything but relegation candidates as they avenged their 2010 final defeat by the Toffees to lift the trophy for the 13th time. Kerr quit last Sunday in response to the Gunners' poor start to the season - they have lost three of their opening four league games and are bottom of the table with a solitary point. But she opted to stay on for this match at Stadium MK as Arsenal looked to add to a tally of 40 major trophies since they were formed 27 years ago. They entered the match as favourites, in no small part because of their impressive record of 12 victories from their previous 13 appearances in this fixture. And the Gunners, league title winners in nine of the past 10 seasons, began in suitably confident fashion in front of a crowd of just over 15,000 fans in Milton Keynes. Everton - just a point and a place above Arsenal after a similarly sluggish start to the campaign - did have an early sight of goal through striker Nikita Parris, who shot over after just 25 seconds, but the Toffees were quickly having to defend as Arsenal started to dominate. Winger Rachel Yankey struck the inside of the near post with a stinging 25-yard shot but it was veteran striker Smith who would prove the game's most influential figure. The 35-year-old put the Gunners in front with a sublime piece of technique, curling a 20-yard free-kick over the defensive wall and just inside the post after 15 minutes. Everton attempted to hit back when captain Michelle Hinnigan sent a long-range effort into the arms of goalkeeper Emma Byrne. But Arsenal were soon back on the offensive and striker Danielle Carter, an impressive performer throughout, sent an effort from 18 yards inches wide. And a minute before half-time, goalkeeper Rachel Brown-Finnis pulled off a goal-line save from Carter's diving header. Smith went close to doubling the lead six minutes after the interval, curling a shot against the far post from 15 yards as she cut in from the right side of the penalty area. She did not have to wait long to celebrate again, though, as 10 minutes later her pass set up Japan international Kinga to shoot home from 12 yards. Kinga's compatriot Shinobu Ohno forced an excellent save from Brown-Finnis, who within seconds had to keep out an Alex Scott shot. As the game moved into its closing stages, Everton gallantly attempted to force their way back into contention and Parris went close with a late header. Arsenal almost grabbed another goal of their own when left-back Emma Mitchell hit the woodwork in stoppage time, but their earlier efforts were enough to ensure they gave the departing Kerr the perfect end to her spell as manager. Arsenal: Byrne, Scott, Mitchell, Kinga, Stoney, Ohno, Carter, Smith, Yankey, Fahey, Bailey. Subs: Chamberlain, Williamson, Murray, Weir, Ayisi. Everton: Brown-Finnis, V Jones, Greenwood, Chaplen, Johnson, Hinnigan, Parris, K Jones, D Turner, George, M Turner. Subs: Walsh, Whelan, Magill, Whipp, Murphy. "They're a fantastic group of players. It was never about me today - it was all about the team. I thought they showed their talent, composure and patience and they got what they deserved. "I'm not sure what's next for me. I'm going to have a couple of weeks off, reflect, evaluate and take some time out." "The incentive today was to win for Shelley - we have got some champagne ready for her. It is a shame she is going because she has taken this club forward. We have a new team after losing eight players in the close season, but you could see little bits of things coming together today."